It's Short Reviews of RiffTrax Shorts, our new series where the title is almost as long as the actual reviews! We are going to take a look at a RiffTrax Short almost every day this year, until we run out of shorts. That will get us through the majority of the year, so strap in for madness! It's our first Encyclopedia Britannica short! Much like Coronet (and ACIm which we haven't been introduced to yet), a decent amount of the RiffTrax Shorts catalog is composed of Encyclopedia Britannica shorts. 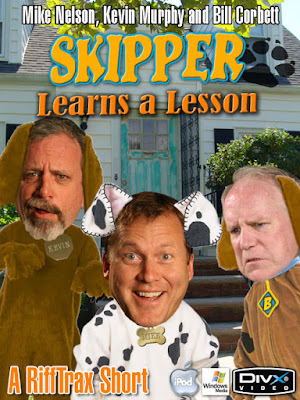 Skipper Learns a Lesson is about a dog who has to learn to like other dogs based on what is inside them. No, I don't mean worms. I mean the fact that who a person is on the inside is more important than how they look. Skipper learns this lesson by first rejecting the other dogs in the new neighborhood his family just moved to, somehow getting covered in poster paint, and then having the dogs reject him. Poignant stuff. This is one that—while not necessarily a PB&A Essential—I have watched countless times and still belly laugh a few times. Skipper Learns a Lesson gets four angry Skippers out of five.